Located 40 kilometers from the heart of Shanghai, Happy Valley of Shanghai consists of Sunshine Harbor, Happy Hour, Shanghai Bund, Shangri-La, Happy Ocean, Gold Mine Town, and Hurricane Bay. 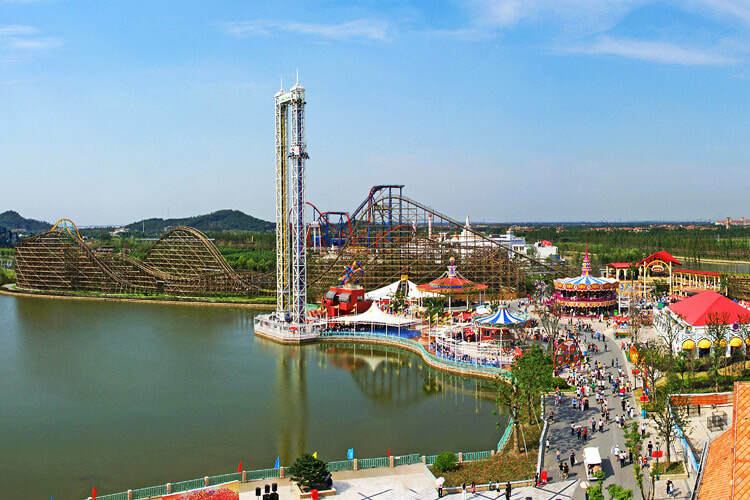 Situated 25 kilometers from Hongqiao International Airport and 68 kilometers from Pudong International Airport, Happy Valley of Shanghai offers more than 100 rides to experience. The Sunshine Harbor is located in the southeastern part of the park. It is a romantic harbor with a strong British style featuring European Gothic architectures in the 19th century. You can enjoy yourself at the flying theater. Located in the southeast of the park, Happy Hour presents as a prosperous European town in the early 20th century. If you are adventurous, it is recommended that you try the ride of Gumu Youlong. At the ride, you will experience 10 times of weightlessness. As it is fairly popular, you’d better try it upon entering the park. If you visit the park after 11:00am, it is recommended that you enjoy it before you leave the park in the afternoon. At Shangri-La you can raft through the winding canyons and fly through the lush rainforest on the Mega-Lite. The Mega-Lite dives down from the height of 30 meters at a speed of nearly 100km/h. The amazing speed will offer you a wonderful feeling of flying freely. Because the impact speed is too fast, those whose cervical vertebrae and lumbar spine are not good are not suggested to experience it. The Shanghai Bund features the scenes of the Bund half a century ago, and there is also a drop-out roller coaster that represents the top level of today's entertainment equipment and the big pendulum clock, and so on. You will experience the Old Shanghai and modern Shanghai there. The thrilling Hurricane Bay area is the stage for the brave and the adventurous. You can take the flume ride from the height of 26 meters and take a boat to experience the large waves of the Perfect Storm composed of two rolling cockpits. At the Gold Mine Town in memory of the history of the gold mining in the western United States, you can take a mining car and experience the thrilling scene of miners escaping from the flood. The top of the Treasure Island offers a panoramic view of the park. Suitable for children to play in, Happy Ocean is fitted with sailing warships, ocean adventures, water flying boats, small flying fishes and other fun projects. The best time to visit Happy Valley of Shanghai is in the morning except at weekends and during the holidays as it always takes several hours to explore the park. The best months to visit are from May to October. There are a few buses passing by the Happy Valley of Shanghai. Therefore, there are only a few options. Rent a vehicle to the Great Wall of China (Mutianyu). This is the quickest and most direct option. Take Bus Songjiang 19 (松江19路) and Songchong (松重线). Then, walk to the park. Take Metro Line 9 to the Stop of Sheshan (佘山站). Then, walk to the park. It is not suggested to visit the park at weekends or during the holidays. Pregnant ladies and those who are suffering from heart diseases, high blood pressure and mental diseases are not allowed to take some of the rides. The park offers the shuttle bus or the bubble car for extra charge. The park offers the free wheelchairs and strollers. If you would like to take the wheelchairs or the strollers, you have to pay the rental charge. Interested in visiting Happy Valley Shanghai on a Tour? Wendy Wei Tours offers a variety of different packaged tours as well as custom tours including Happy Valley Shanghai, among other attractions and destinations. To find out more, please visit our Tours page or Contact Us directly to find out more.